Nothing says spring time more than pastel colors. I love when my outfits match the season or occasion – I will freely admit I love playing dress up and theme/costume parties! What girl doesn’t!?! 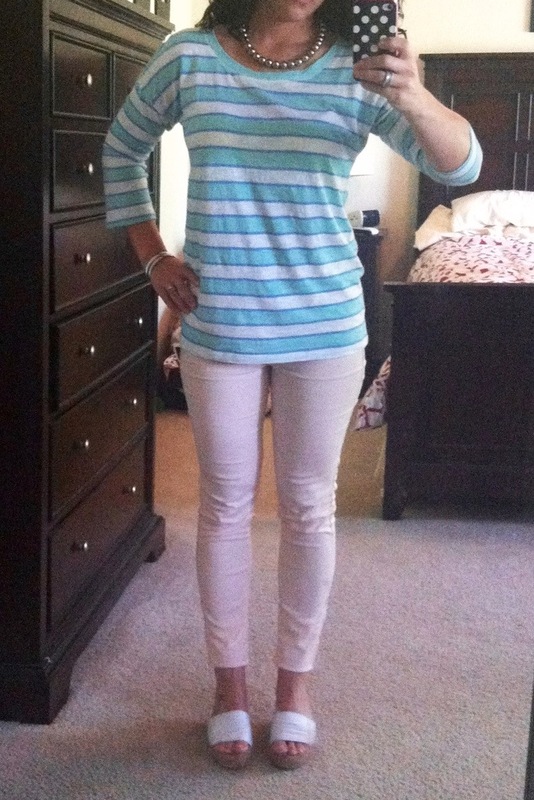 Blue and sea foam striped top $5 from Old Navy. Those of you who are faithful followers, if this shirt looks familiar that is because I bought the same shirt in coral and pink, last seen here. If you find something you like and the prize is amazing, buy several in different colors or prints! Pastel pink skinny jeans by fire Los Angeles $19.99 from Nordstrom Rack. I love the color of these jeans! They are so cute and girly! White wedge slides by Steve Madden, bought several years ago. I wore all silver accessories with this outfit. Until a few years ago, I only wore silver jewelry, I have no idea why, but I never wore gold. I will admit this is odd and I was totally limiting accessory choices! 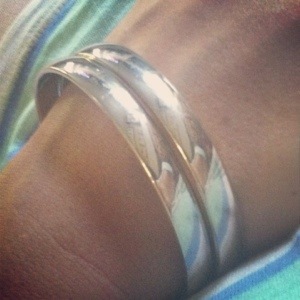 My mom gave me these sterling silver bangle bracelets in college. I love how simple they are. I also wore a silver beaded necklace that I got from my grandma and matching silver ball earrings. Happy Spring! Stay fabulous and be frugal!